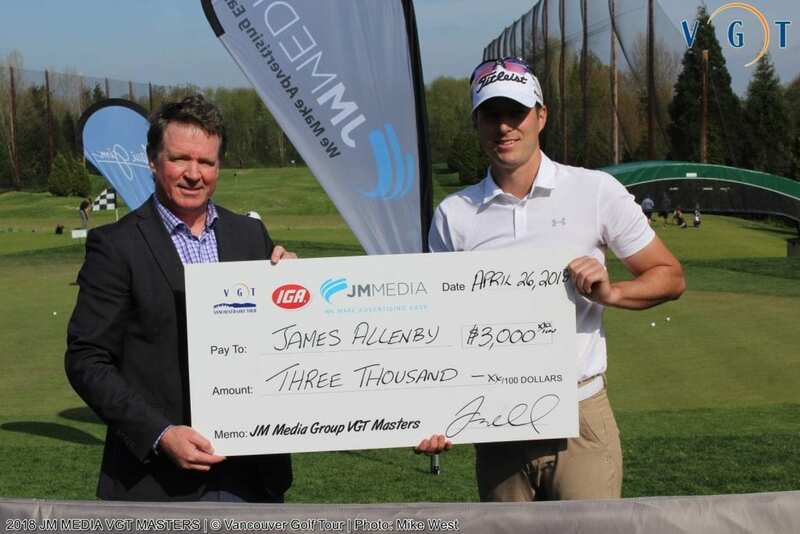 Langley’s James Allenby cards back-to-back 64’s on route to 7-shot JM MEDIA MASTERS Win! 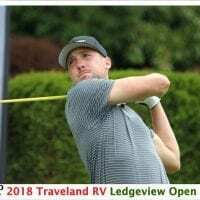 In what first looked to be a 3-person showdown at VGT’s first Major of the year, Langley’s James Allenby shifted his game into high gear and separated himself from the field on route to a 7-shot victory over Professional Riley Wheeldon. Although it was James Allenby’s record-setting performance that stood out at the end of the 36-hole Championship, through the middle of the tournament it was 24-year old rookie Pro Karishma Thiagaraj who stole the show with a career-best tournament round of 64 (-8). Thiagaraj would take the solo clubhouse lead and was the talk of the tournament come lunchtime. A new player to the VGT this year, Thiagaraj stormed out on the front nine on Thursday with 2 birdies and then a perfect iron shot on the 8th that led to an ACE for an opening nine of 32 (-4). But she wasn’t done with the birdies. She continued with 4 more birdies to close with a 64 (-8) and hold the clubhouse lead with about half the Pro field yet to post. VGT Commissioner Fraser Mulholland interviewed Thiagaraj after the round and it turns out she had quite an impressive Junior and Amateur career down in the Virginia area. As a 14-year old, Thiagaraj won the 2008 Virginia Junior Championship and followed it up with a runner-up finish in 2009. Then she would then carry on with a 3rd place finish in the Virginia State High School Championships later that year. Thiagaraj’s impressive junior records took her to James Madison University where she studied Health Sciences and continued to develop her tournament resume where she racked up two top 10’s and five top 20 finishes in NCAA competition. Since her University days, Thiagaraj has been competing in the Virginia area and performing quite well. She registered for LPGA Q-School in the fall of 2017, but after a frustrating end to her golf season Thiagaraj moved up to the Vancouver area to stay with her Aunt and prepare for her 2018 golf season. 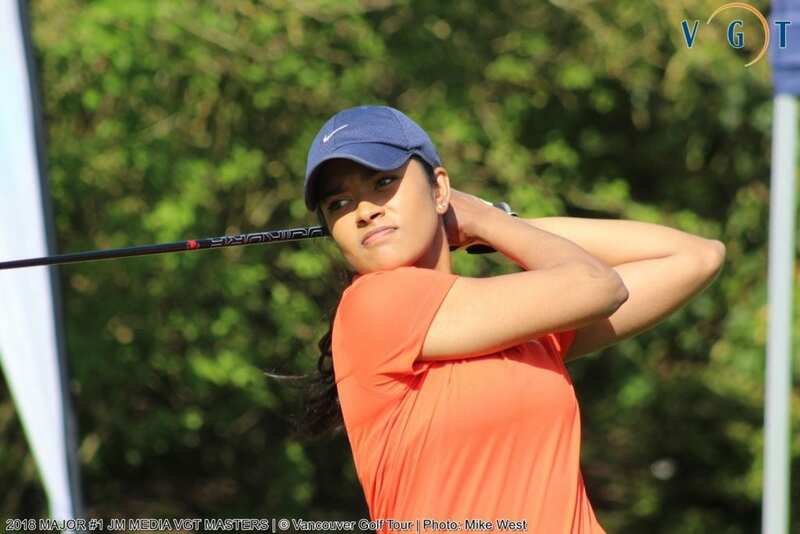 After joining Meadow Gardens Golf Course she learned about the VGT from their Club Pro Curtis Baldwin and after (in her own words) a very serious training regime in the winter, Thiagaraj signed joined the VGT and registered for the VGT Masters as her first competitive event since October of 2017. Less than 48-hours before tee-off, Thiagaraj declared she would turn professional in the event. Apparently the confidence she possessed in making that decision was high. Her opening round of 64 was her career low tournament round by 5 shots, and in her interview she was unphased by what she had just accomplished. “Whenever I had gotten to 3 or 4 under par in an event before, I had become far too tentative and this ultimately led to me coming back closer to par. But today was different. I had a very different approach on the back nine. I just said keep on playing confidently and aggressively and let’s see how low you can go” stated Thiagaraj. Had it not been for a 3-putt par on 17 and a missed 10 footer on 18, Thiagaraj may have come in with a round of 62 or 63 on the day. But she didn’t, and when Langley’s James Allenby rolled in an hour later with his own round of 64, the two were tied at the top with a 3-shot lead over Comox’ Riley Wheeldon. The 33-year old Allenby, who is arguably BC’s hottest player of late continued his unbelievable play in round 2, carding 8 birdies and an eagle on his way to a second consecutive round of 64, good for a 7-shot victory over Riley Wheeldon and the $3,000 winner’s cheque! Allenby has been playing some absolutely outstanding golf the past 2 seasons on the VGT and came into this event having carded rounds of 66, 62 (-16) in the BC Match Play Finals. Including his 2 VGT Masters rounds, and his last 4 rounds at 32-under par, James Allenby’s golf is worthy of contending on any tour including the PGA Tour. He is coming off a banner 2017 season with the VGT earning Player of the Year honors and taking home both the Majors Series and Cleveland/Srixon Bonuses totalling $5,000. Through the end of the JM Media Masters, Allenby leads the 2018 Cleveland/Srixon Order of Merit by 1,500 points over Kevin Stinson. 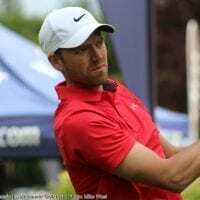 Stinson hopes to chase Allenby down for the spot into the MacKenzie Tour’s FREEDOM 55 FINANCIAL OPEN at Point Grey at the end of May. The spot will be awarded to the top VGT Pro at the end of the Player’s Championship on May 18th. Hard to take anything away from Comox’ Riley Wheeldon, who played some great golf of his own, carding rounds of 67, 68 (-9) which was four shots clear of his nearest competitor Patrick Sato (Amateur) earning him an $1,800 cheque. Cheam Mountain’s Kevin Stinson made the most of his second round, carding a tidy 68 and rounded out the top 3 Professionals in the field at -4 and cashed a cheque for $1,400. Although not the day she had envisioned in round 2, Karishma Thiagaraj was very optimistic about her first ever Professional tournament. She hung in there right to the end and thanks to that earned a top 10 finish overall, cashed her first Professional Cheque, and earned the MAUI JIM Women’s Series Bonus ($250) for being Low Female Professional in the tournament. She was 2 shots clear of her nearest female competitor (Christine Wong) and will head into the 2nd event of the Maui Jim Women’s Series with the Order of Merit Lead. At the end of the 6-event Maui Jim Women’s Series, the top female Professional will not only have a chance at a total of $1,500 in bonus money throughout the series, but a Bonus cheque of $1,000 that will be handed out to the Order of Merit Winner. 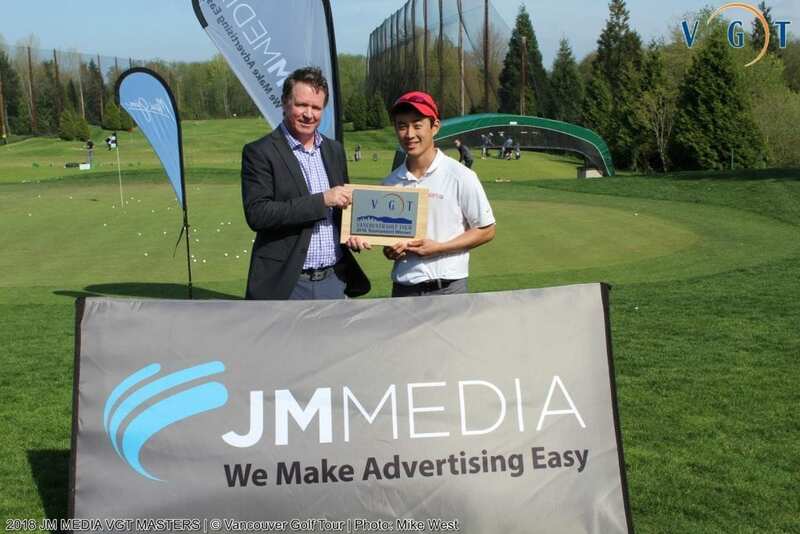 In Amateur side of the JM MEDIA VGT Masters, Sammamish, Washington’s Patrick Sato was crowned Amateur Champion after 2 very solid rounds of 69, 70 to edge out Calgary’s Brett Hogan by 3 shots. Capilano Golf & Country Club’s Stu Bell would round out the top 3 in the 36-Hole Amateur Championship. Sato earned himself $450 in VGT Prize Credits while Hogan earned $300 and Bell $250. Low Female Amateur honors went to Washington State golfer Sarah Lawrence, who earned a $200 Maui Jim Prize Bonus as part of the Maui Jim Women’s Series. Day one of the JM Media VGT Masters offered Amateur golfers 5.1 to 18.0 handicap the opportunity to compete in an 18-hole flighted competition. 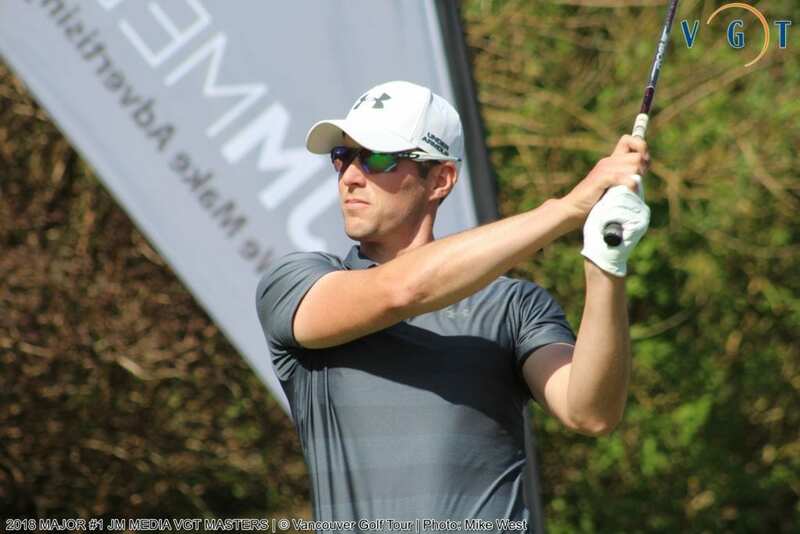 Thanks to JM Media Group’s support, all amateurs in this event and the 36-hole Major tournament were provided with a sweet Travis Mathew Hat as their tee-gift, and over $40/player in dedicated amateur prizing! At the end of the day here were the JM Media Masters 18-Hole Event winners!! Allenby’s two rounds of 64 makes him (-32) for his last 4 tournament rounds!! Allenby’s two 64’s equaled Morgan Creek’s competitive course record. This marks Allenby’s 3rd course record since he shot 63, 61 at the Chilliwack Open in July, 2017. Riley Wheeldon has been playing some great golf down in Phoenix this winter posting four top 5 finishes including a 2nd and 3rd place finish on the Dream Chaser’s Tour. 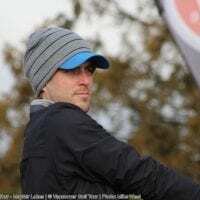 At the time of posting Wheeldon sat 3rd place on the Phoenix Mini Tour’s Order of Merit out of 175 Professionals, so not surprising to see his good play this week. Special thanks to our Tour Title sponsor IGA Stores of BC, our event Title Sponsor JM MEDIA GROUP, our Women’s Series Sponsor MAUI JIM CANADA and to all Major and Supporting Sponsors of the VGT. Continued thanks go out to the Management Team at Morgan Creek Golf Course for assisting us with our operations and making this an exceptional experience for our players. Your service is second to none, your golf course layout and course conditions are simply outstanding. You are a true treat to work with on all aspects of the events we host with you! See you again in the fall!